The Employee Exit Interview template is a business tool that allows companies to gain useful information from employees during the separation process. Many companies have used the data collected during the exit interview process to reduce liabilities in litigation, modify or create policies that decrease absenteeism, and resolve any issues that may not have been brought to the employers attention previously. This is an important document for every employee file. Best of all this free, simple to use template offers customization and secure downloading. You can keep your document readily available for policy updates or use. 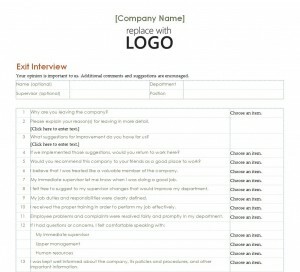 The Employee Exit Interview gives your business insight into what a perspective employee is looking for in a company. Useful data assists in developing strategies that will increase productivity and overall team management. This interview is the last impression the company will leave on the employee, it gives an impression of importance to the employee, thus reducing a negative reputation. The employee feedback received provides a simple way to collect information that is an integral part of the Human Resources process. Step One: Customize the Company Name and Logo, include current address, phone number and fax number. Step Two: Include items specific to the employee. These items may include: Employee Name, Employee Supervisor, Employee ID, Beginning/Ending Pay rates, Hire and End Dates, Employee Position, and Space for the employees signature. Step Three: If your company has set up a database to monitor trends and record employee information, enter the appropriate data. File the completed document into the employees personnel record. Consult with Leads, Supervisors and Managers who have direct contact with employees on a daily basis. Anytime there is a change or addition to company policy, always review and update your master copy of the document. Direct employee communication is standard practice within every successful company, using the Employee Exit Interview takes it a step further.